Cannabis, an illicit substance has reportedly become the cure to a little girl's epilepsy, popular reports have claimed. A little girl from Tuscon, Arizona in U.S. who suffered from a rare condition causing such debilitating and dangerous seizures that she was put into a coma, has been cured by cannabis. 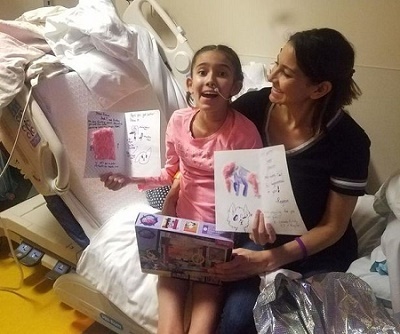 Annalise Lujan, 12, was taking part in a gymnastics class when she began vomiting and lost all feeling in her legs. She suffered a severe seizure and was rushed to hospital where paramedics put her in a medically induced coma to stop any further damage being caused to her brain. The youngster was flown to a specialist unit at Phoenix Children’s Hospital where she was diagnosed with febrile infection-related epilepsy syndrome (FIRES), an incredibly rare condition affecting just one in a million children. Her mother, Maryann Estrada-Lujan, told KVOA : “One day, she was just a healthy young lady, going to school, participating in her community and her gymnastics, and the next day – fighting for her life. “She was put on a ventilator, and put into a medical coma, and, we haven’t talked to her since. The condition was causing Annalise to suffer constant seizures which can prove to be fatal, but normal epilepsy medication was ineffective against FIRES. Doctors were not able to bring her out of her induced coma until they found a method of controlling the seizures. Her mother began researching alternative remedies and discovered a cannabis -derived drug, Cannabidiol, which had been successful in previous epilepsy cases. She lobbied for the drug, which has low levels of THC which is the active ingredient making people ‘high’, to be given to her daughter. Doctors had to rush through its approval with the FDA and DEA as the drug was not yet approved. After just three treatments the schoolgirl was able to be brought out of her coma, and no longer suffers from the crippling seizures.